Align your investments with what matters most. To you. Accord Capital Management is committed to creating an enduring and valuable wealth advisory service to help our clients achieve well-being and what matters most to them. That’s why we’re committed to helping you create “Your Conscious Portfolio”. We strive to help our clients clearly articulate three guiding principles behind their investments: what kind of impact they want to have, how deep or broad their intended impact is, and the level of risk they are willing to accept. We meet with you at each step of “Your Conscious Portfolio” process. In addition to monthly financial reports, clients receive a detailed annual impact report highlighting key social and environmental outcomes of their portfolio. Our goal is to guide you in creating a conscious portfolio which align with your missions and goals, and with what matters most. To you. WHAT IS A CONSCIOUS PORTFOLIO? A conscious portfolio is clearly defining personalized investment goals and objectives and being intentional about the companies invested in. Our goal is to guide our clients to be informed about investments with the intention to generate social and environmental impact alongside a financial return, and based on personalized risk tolerance. We blend “fiduciary duty” with “impact fidelity” in an attempt to achieve the impact preferences that each client articulates. Transparency matters, so our clients have 24/7 access to their investment accounts. And, to measure your impact, Accord Capital Management reporting services leverage data-driven portfolio analysis tools to give you a clear picture of Your Conscious Portfolio. What are your investment priorities and how do you want to make an impact? By identifying where you wish to invest, the desired intensity of impact, and an investment’s risk profile, we can start to identify “Your Conscious Portfolio” and then look within your financial portfolio, asset class by asset class, to find investments that map onto your clearly defined financial risk and return, and impact objectives. Ultimately, we develop a matrix with your financial profile (e.g., liquidity, fixed income, public equities, etc.) down one side and impact classes (e.g., place, process, planet) across the top. We’re committed to you and Your Conscious Portfolio. See the following sample equity portfolio analysis which demonstrates rankings that we apply to your investment portfolio. Our triple bottomline analysis ranks how your investments impact people, planet, and profit. Our Portfolio Analysis ranks the following impact themes: Community, Employee, Environment, Governance. Then we go deeper into what matters most to you. 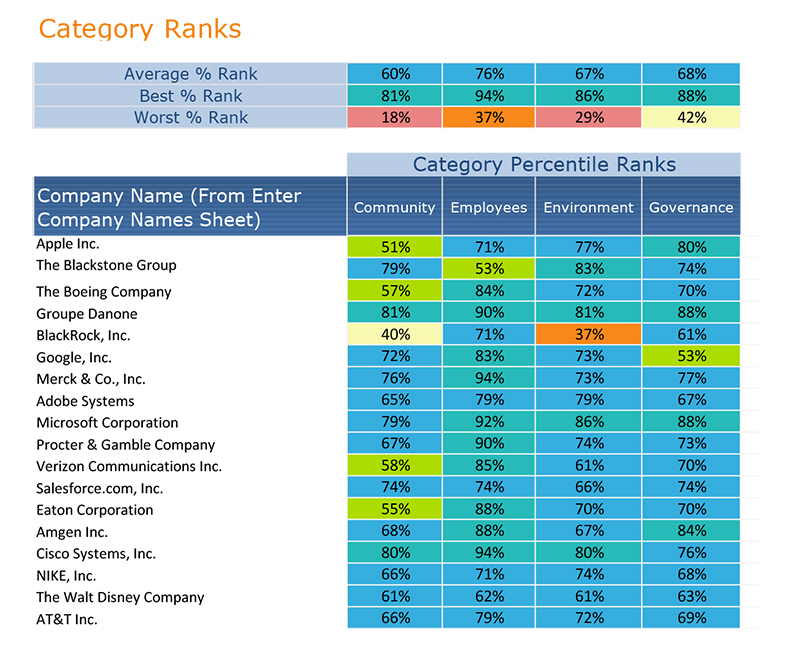 Our Portfolio Analysis ranks a variety of impact themes across Community, Employee, Environment, Governance Categories.